For millennia, people relied on rainwater harvesting to supply water for households, landscape, livestock, and agricultural uses. Today, our planet's water shortage is a reality for people worldwide, but actually enough precipitation falls annually to provide ample water for everybody. We simply have to collect, store, distribute, and reuse just a small percentage of that which falls from the sky. Fortunately this way of saving the world comes with perks such as increasing your property's value, lowering your utility bills, or simply creating a comfortable oasis outside your door. 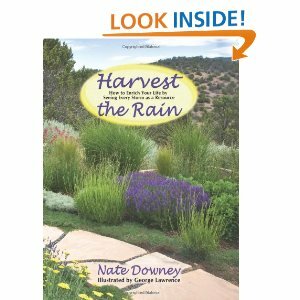 In his new book, Nate Downey shows you the way that anyone can use to begin implementing rainwater harvesting designs today Harvest the Rain is low tech, designed for everyone, everywhere, even for those with limited time and money. 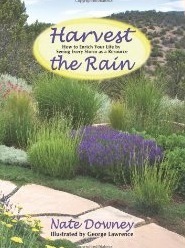 In addition to cisterns, gray water, and earthworks, the book shares important ways to help protect your local watershed.